A group of 42 troops consisting of 27 students split up into the four mythical icons of Vietnam: Dragons, Tortoises, Unicorns and Phoenixes, just recently returned from a two week long stint in Vietnam. We arrived in the extreme heat and even more extreme traffic of Saigon and spent a few hours exploring the area. The culture shock and the smell was instant but we got over this quickly and soon returned back to base Vien Dong with around 10 DVDs each. Next day we had an early flight to Hanoi where our first stop was a war museum then onto Maison Centrale AKA The Hanoi Hilton-A prison where the French held the Vietnamese political prisoners. Later that day was one of the highlights of the trip when we each individually took rides on bicycle carts (called Cyclos) around the city for an hour. The most amazing experience on the trip had to be spending the night on two boats in Halong Bay in the middle of the Indo-China Sea this also included a trip to the Surprise caves on an island in the middle of the sea. We spent the night buying real pearl jewellery and singing Karaoke on the Junk (Vietnamese boat). We also had the chance to taste the Vietnamese cuisine of seafood consisting of shrimp, clams, prawns, squid and for those allergic to seafood duck eggs! Next we travelled south to central Vietnam and visited Khe Sanh and experienced what life was like for the Americans during the war. Then on to Da Nang where we visited a school with 7000 students. The dragons introduced the locals to a bit of New Zealand culture, and entertained the students with a Haka. From here we marched on to one of the most exciting little towns we have ever experienced, Hoi An. Hoi An consists of at least 400 tailors and dress makers, which the whole tour party definitely took advantage of. By the end of the second day everyone was sporting fancy tailor-made suits and dresses, and the odd pair of shoes or four. The Pho Hoi resort included a luxurious pool that was the perfect finish for a busy day of commuting around the busy streets, listening to "scoose me, you come look in my shop, please buy something". We returned to Ho Chi Minh city, formerly known as Saigon, for the last leg of our trip. Here we enjoyed the markets and several of us came back with North Face jackets for $40 with a RRP of $400 in New Zealand. We made a day trip to the Cu Chi tunnels where the Dragons fulfilled a life long ambition, firing an AK47. The noise was amazing! All in all a well enjoyed trip, and a great first taster of Asian culture. Our tour leader Gen. Wes Melvin kept us all in formation and made sure we all came back in one piece. Thanks to Mr Melvin for his co-ordination and to everyone who supported us in our fundraising, we had the trip of a life time! 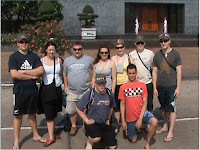 Sin Chow, Vietnam Tour 08 Team.